This past week I was suffering from a case of garden fatigue and hardly set foot in the vegetable garden. Harvested some cilantro and cherry tomatoes for friends and neighbor and that was it. So, for today’s Harvest Monday, I am featuring the 4 varieties of sweet potatoes and a carrot grown and harvested at Locust Grove Heritage Vegetable Garden (LGHVG) where I am a volunteer. 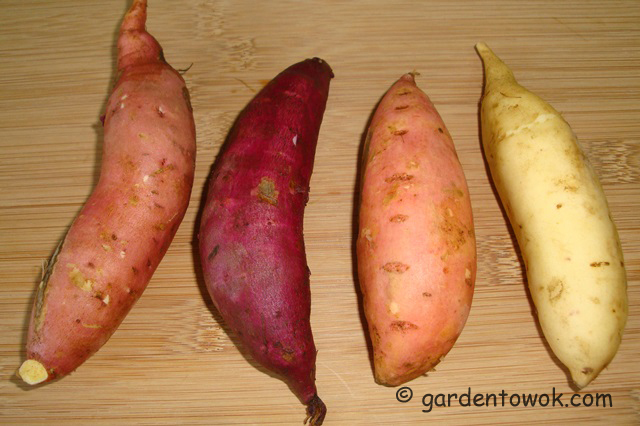 The 4 sweet potato varieties are: Lace Leaf, Purple, Georgia Jet and Frazier White. All are short season varieties suitable for growing in the Hudson Valley, New York. While harvesting we noticed some critters were nibbling on the tubers underground. We also noticed the critters had a preference for the lace leaf variety, I think we lost about ¾ of the tubers (most were partially eaten). They nibbled on the other 3 varieties also, but just a few of each, thank goodness. The best looking tubers were put aside for show-&-tell at Sunset Sensations (Thursday, 10/10/13). A few tubers of each variety are in winter storage for starting slips next year. The remainder, we (the volunteers) got to take home. A real treat. To compare texture and flavor, I cooked the sweet potatoes, all 4 in the same pot, whole and unpeeled, using the steaming method. The Frazier White has the driest texture of the 4 (like a russet potato), with just a hint of sweet potato flavor. I think it would make a great potato substitute for people who are allergic to regular potato. It is somewhat bland, making it a good candidate for savory dishes (I am thinking home fries with onion and crispy bacon). Stays firm after cooking, would hold up well in stews, soups ….. The Lace Leaf and Purple have firm, somewhat dry/creamy texture (like a Yukon gold or red skin potato) and a somewhat bland nutty flavor. These 2 are my favorites. I would use them in savory dishes also (a sweet potato salad combining Frazier white and purple served in a lettuce cup would be pretty). Georgia Jet has a watery/mushy texture. The color and flavor are the same as the familiar sweet potato in the food markets. Not my favorite. The texture and flavor of all 4 varieties will be different from the above if boiled or baked. 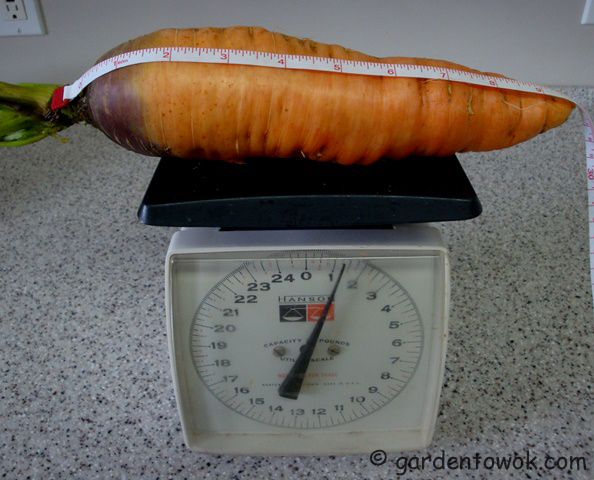 Below is one of the carrots harvested at LGHVG on Thursday. This is the first time in 13 years we are seeing carrots of this size. This must be the year of the fat carrots. 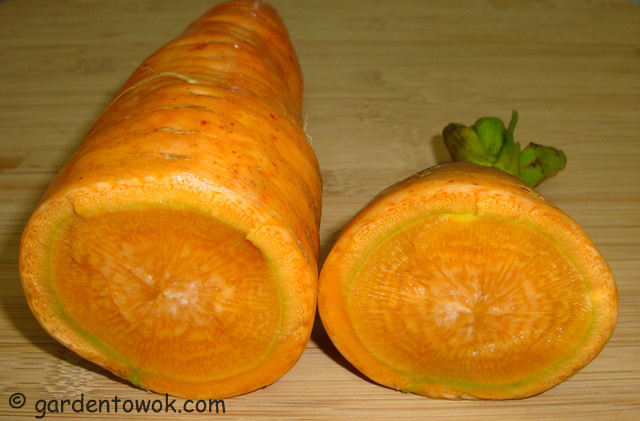 The carrot I posted on 9/30/13 (click here for the post), is a variety called Little Fingers. That carrot did not look like a finger at all, it was more like a fat big toe. What caused the carrots to grow out of control? Is it due to the wacky September weather we had? If my memory serves me correctly, we had an unusually cold September start, night time temp fell to the high 20’s low 30’s with the threat of frost. This was followed by a “heat wave” (I believe there was a 90° day). The last week was 60’s and 70’s, just gorgeous. The poor carrots were probably sooooo confused. Right photo: cross section of the above carrot. I was surprised the carrot was not woody (I had expected it to be). It was crispy but not sweet at all. I did not enjoy it raw. Added some slices to a stir-fry, it was OK (had a very slight bitter aftertaste). I think it would taste better in a stew with herbs and spices. I have been planting this daisy for decades, never touched by any critters. This year the baby deer have taken a liking to the plant and eaten most of the buds. This entry was posted in Flowers, Gardening, Growing sweet potatoes, Harvest Monday, Heritage vegetable garden, Locust Grove, Vegetables and tagged carrots, fall blooming daisy, frazier white sweet potato, Georgia jet sweet potato, lace leaf sweet potato, purple sweet potatp, sweet potato. Bookmark the permalink. Oh I am so far behind, I haven’t tried all the various sweet potatoes and what a whopper of a carrot! Have a lovely week ahead Norma. I am sure you will get around to trying them all when you are not so busy. A lovely week to you too. your carrots are on steroids!! Made me giggle! What a great harvest of sweet potatoes, I love the colours, so pretty! Isn’t that some carrot!!!!! Yes, the sweet potatoes are pretty and delicious too. I wonder if the critter that has been munching on the sweet potatoes was a vole. They ate my beet crop a couple of years ago. It could very well be vole or may be mole. Purple is one of my all time favorite sweet potatoes now (and I have you to thank for it). Sadly I have an insect that eats the tubers underground also. But they don’t spoil the whole tuber. They mess up the skin. After curing they keep just as well as any other sweet potato. I just can’t bake it. I have to peel the damaged parts off and cut them up before cooking. I’m OK with that. Of mine all my Beauregard had damage. And; almost none of the purple or garnets. So I’ll bake the latter two, and mash or cube the Beauregards. You had sent me a white one too, and I think it might be the Fraiser White. It did remind me of a regular potato, though it was sweeter. I liked it a lot, but it barely produced anything here, so I didn’t keep it. I am so glad you like the purple SP and it is growing well for you. Insects and other critters are a problem for all gardeners especially since we do not use chemical. Thanks for a great test on the sweet potatoes! I like the idea of having different ones for different uses. I am anxious to see how our purple ones did this year. The idea of using them in salad is intriguing. I don’t think I have ever had sweet potato salad! You are welcome. Looking forward to reading about your purple SP. I love purple potatoes, but until this I wasn’t aware there’s a sweet variety as well. Thanks for the education! You are welcome. Hope you are able to find purple sweet potato where you are. That carrot is enormous! I’m surprised that it wasn’t woody too, usually large vegetables tend to get that way. The sweet potatoes are beautiful, I love that purple one. We’ve had crazy weather too but this weekend really sucked! Rain and cold and no sunshine at all. Wednesday was warm and sunny, we had a glass of wine (or two) on our porch with our neighbour. We closed the cottage down, I can hardly wait to see if the garlic will take! Yes, I may be wishing the winter away. You can get the purple sweet potatoes at Asian markets in Toronto. Not to worry, the garlic will grow and surprise you when you open the cottage in the spring. Thanks for breaking down the different potatoes Norma – great info! Oh my, I am more and more wanting to try growing sweet potatoes! They look so good! And that carrot cracks me up; I have yet to grow even a regular sized one, much less one on steroids! The sweet potatoes were delicious. Besides the tubers, I also enjoy eating the edible sweet potato vines. There are actually many more varieties, but most are not suitable for growing in our area. Is the New Zealand kumara SP very different from the Georgia jet? I think the carrot has something to do with the weather. I have a bunch that are huge – half to 3/4 of a pound. And none of mine have forked, which is very unusual. I think it’s been our fairly regular rain. Yep, it’s got to do with the weather. Some of mine did fork but it could be due to rocky soil condition. May be the flavor will improve after we have a hard frost, will post an update then. I virtually live on sweet potatoes which closely reseble the ‘Georgia Jet’. Methinsk we more or less call them the NZ kumaras . . . . Fantastic to read, look at and learn what else falls in the category!! You are the second person to mention the NZ kumaras, must get online to learn more. Wowza! That’s a big carrot! And the daisies are pretty. I love purple sweet potatoes, too. I’ve grown Okinawan purple (white outside) with very little success. I got my tuber from Hawaii years ago, and was scared to death by husband’s cousin who was born in Hawaii. He said it was illegal to bring the Okinawan potato out of the island, but I see them in all the Asian markets now! Did not know it was illegal to bring the Okinawan potato out of the island. Tried rooting one of the tubers from the Asian market but was unsuccessful, guess the tubers were treated with growth retardant. Should look online to see if slips are available for purchase. Norma, I think he was just pulling my leg. I have one tuber that’s sprouting right now. Lemme try growing more slips, then I can offer some to you. If I succeed, of course. You know me, still a novice with a few things. You are growing sweet potato slips for growing now? What planting zone are you in? Thanks for the offer, I would love to have a few slips but I cannot accept any until February/March the earliest. Last year I tried overwintering SP slips and it was a failure. No, I wasn’t purposefully growing slips. I had a few small tubers from last year’s planting and I put them on top of some potting soil, didn’t even cover them. Most dried up or rotted, but one grew a tail 6 in. long with some leaves on it. My plan is to pot it up and bring it indoors as a houseplant. Maybe it’ll grow more stems and leaves, who knows. I’ll be happy to send you some slips if it does grow! Hope your sweet potato plant does well indoor as a houseplant. Thanks, the word “steroid” just popped into my head when I looked at the carrot. I believe it was vole, a woodchuck was visiting also but I do not believe they dig underground to feast, I could be wrong though. 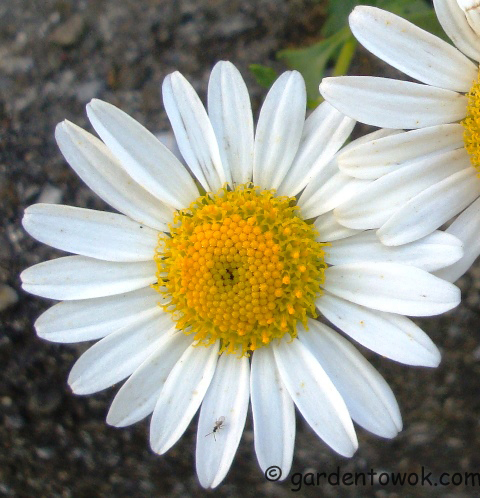 Daisies blooming at this time of year makes the garden very cheerful. Many thanks for sharing the treasures from your garden, dear Norma. Thanks for you kind words and you are welcome, makes me happy to share. Whoa, that a big carrot, love purple sweet potatoes. Too bad it did not have good flavor. Are you able to grow sweet potato where you are? I need to start trying some different sweet potatoes! They’re so good for you! Holy moly that carrot is a big one!! Do you grow sweet potato? Can you buy different SP varieties where you are? Not as many varieties! Never seen a purple one! If you have an Asian market nearby, you may see white skin purple flesh sweet potatoes. Love the purple sweet potato! Wow, I love the variety of your sweet potatoes…and the huge carrot…absolutely amazing Norma. I suppose where you live you are able to get many different varieties of sweet potatoes. Loved seeing all the various sweet potatoes! That is some carrot! WOW. Are you able to grow sweet potatoes where you are? It is a huge carrot, wish it was better tasting. Wow Norma, what a beautiful array of sweet potatoes! I wish I’d had all of these on hand when I made that sweet potato tortilla 🙂 The creamy and nutty flavour of the purple has always been my favourite, too. You can make another batch of sweet potato tortilla. You do know that you do not plant the sweet potato tubers. You need to grow slips from the tubers. If you do not, visit my January 23, 2012 post to learn how to. Here is the link: https://gardentowok.wordpress.com/2012/01/23/harvest-monday-january-23-2012-growing-sweet-potatoes/. There are 2 posts for that day.